Doncaster Knights dished out a 57-16 beating at promoted Richmond in a nine-try romp. 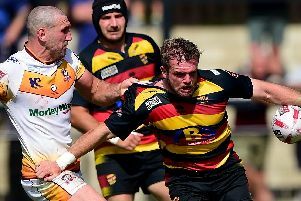 Director of rugby Clive Griffiths knows there is more to come but he had few complaints after seeing his side inflict Richmond’s biggest defeat of the season. “We’d looked at how Richmond had defended in their first two games and we put a few plays together we thought would help us break them and that was certainly the case,” he said yesterday. “We scored some absolutely phenomenal tries - some from structured plays and some not – and they were a joy to watch. We also had a couple disallowed for what must have been marginal decisions. “Our main focus this season is playing with width, pace and tempo whenever we can – along with a such as a strong driving maul - but a lot of that is dependent on how teams defend and how the referee controls the breakdown. “Although most of our tries were scored by the backs the forwards played their part and the scrum, in particular, was excellent. “The minus points were our lack of concentration at times from the resulting restart after we scored and another slow start. “That has been a theme in our first three games and we’ll be mentioning it in training.